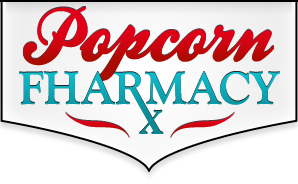 The Popcorn Fharmacy carries 3 sizes of popcorn tins. One of these will be sure to fit your needs. From a small muncher, the 1 gallon tins, or just a popcorn fanatic, the 3 1/2 gallon tins, to the heartiest of popcorn-aholics, the whopping 6 1/2 gallon tins. We have 3 different categories of popcorn. Group A is comprised of our Simple flavors. Group B includes all of our Savory flavors. And Group C is our assortment of Sweet flavors. Specialty flavors are priced separately (call for pricing). Check out our Flavors page for a list of the categories and their flavor choices. On the 1 gallon tins, you can fill these with only 1 choice of the 3 categories that we offer. The 3½ and 6½ gallon tins can be filled with up to 3 flavors of popcorn. These can be mixed and matched to your specifications. For example your can choose categories ABC or AAB or even BBB or any other combination you desire. See our price list for all of the options. To order, supply your size and flavor combination, then print out an order form and fax or mail the information to us.